It is not your typical farmhouse overlooking a typical farm. Instead of miles of rolling pasture dotted with grazing cattle, the ‘farmhouse’ at Mac’s Oysters Ltd. in Fanny Bay overlooks the ocean. If you watch closely, you will spot the occasional seal popping up for a breath of fresh air. There are cormorants and other sea birds bopping along on the waves. Instead of crowing roosters and cackling hens, you will hear the cacophonic cries of seagulls and the chirps of a bald eagle as he surveys his territory from a vantage point atop a nearby cedar. Established in 1947 by Scottish immigrant, Joseph McLellan, Mac’s oyster farm is still owned and operated by the McLellan family. According to his grandson, Gordy McLellan, the company now employs more than 50 people and ships a whopping 80,000 pounds of shellfish to market every week (a total of more than four million pounds per year). In addition to the Fanny Bay location, Mac’s has operations on the shores of Quadra Island, as well as five locations on the Sunshine Coast. Although the McLellans and other BC shellfish farmers harvest their product from the sea, the ocean floor is Crown Land, owned by the Government of Canada. Each farmer leases the ‘land’ and is responsible for operating their shellfish farm in their designated deep water and intertidal beach areas in an environmentally responsible manner. The piles of broken oyster shells and stacks of empty oyster crates beside each and every oyster shack are a testament to the resiliency of this industry. Despite the fact they have not seen a price increase in many years, shellfish farms on Vancouver Island are still surviving. And, just so you know, those heaps of oyster shells you see outside each oyster shack are not trash. Some of the empty shells are used to ‘plant’ and grow new oysters on. The rest of the discarded shells are crushed and used as biodegradable landscaping material or ground up as a calcium supplement for chicken feed. This is a sustainable industry where nothing is wasted. On the coast of Vancouver Island and the BC mainland there are dozens of oyster shacks like Mac’s, where ‘aquaculture’ not ‘agriculture’ is the business focus. There are five main regions in BC where commercial oysters are produced: the Discovery Islands, on the BC coast across from Campbell River; Okeover Inlet and the Sunshine Coast, south of Powell River; Baynes Sound, including Fanny Bay and Baynes Bay; West Coast Vancouver Island, south of Ucluelet; and the Southern Gulf Islands, just north of Sidney. It is interesting to note that the specific oyster species that have made BC a world-renowned oyster producer are not native to these waters. The very thing that makes our oysters so meaty and delicious—our nutrient rich, cold, clean water—also limits oyster spawning and reproduction. So, in the early 1900s, shellfish farmers began importing larger and faster-growing oyster ‘seed’ from commercial producers. 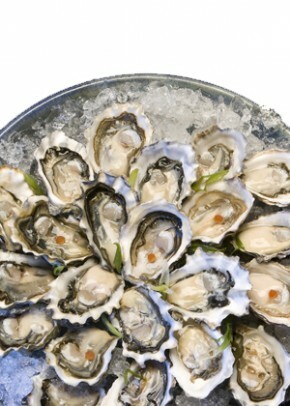 The seed may be from ‘Pacific’ oysters but is imported from warmer regions, like Hawaii. The Olympia oyster is native to this region but is not suitable for commercial production as it is generally quite small and irregularly shaped. This makes them difficult to market on a commercial scale, though they are still delicious. Many Islanders consider it a special treat to be able to harvest and enjoy native Olympia oysters. And, according to the Capital Regional District of Southern Vancouver Island, Olympia oysters were an important food source for First Nations people, who harvested them from estuaries, saltwater lagoons, tidal flats and other protected areas, such as pocket beaches. Today, it doesn’t seem to matter whether they are a highlight on the menu of an upscale restaurant, steaming in a fire pit on a remote beach, farmed, or harvested from the wild, the funny thing about oysters is that people either love them—or not. People who love oysters enjoy them in a variety of ways—they slurp them raw right off the shells, they slather them with hot sauce, they dip them in batter and drop them in a deep fryer, or they toss them on the barbeque to savor their steamy flavor. And, just as each individual’s taste in oyster toppings and presentation varies, oysters from various regions of British Columbia develop their own distinct flavors and unique culinary characteristics, too. In 2009, months before the Province of British Columbia was set to take centre stage by hosting the 2010 Olympic Winter Games, the BCSGA embarked on a special project that would showcase BC fresh oysters to the world. With the support of the various shellfish growers and a grant from Western Economic Diversification’s Community Adjustment Fund and Coast Sustainable Trust, the Association developed a creative a marketing campaign to brand our world-famous oysters with a ‘Pacific Kiss’. Launching the Pacific Kiss promotion during the Winter Olympics was perfect timing, considering that BC oysters are their most flavorful in February and that both the Olympics and oysters have a connection to the time of the Roman Empire. It is believed that ancient Roman Emperors kept a steady supply of oysters on hand for great feasts and visiting guests. Casanova, the famed 18th century Italian lover, reportedly started his day by consuming 50 oysters for breakfast. As part of the Pacific Kiss campaign, each oyster producer was asked to create names for their oysters. The oyster farmers did not disappoint. Some, for example, were given names that linked them to their specific region and/or producer, such as Mac’s Beach, Pearl Bay and Ship’s Point. Others were given fanciful names that were tantalizingly poetic, like Beach Angels or Summer Breeze. One name honored our Salish First Nations people—the Sinku, which means clear running water in Salish. Branding BC oysters with a ‘Kiss of Approval’ is assurance for consumers, restaurateurs and exporters that the oysters they buy are an environmentally sustainable seafood choice. The Pacific Kiss stamp authenticates them as World Class, top quality BC oysters, mussels, clams or scallops that are a delicious and nutritious food choice. As importantly, it is assurance that the product was grown at an environmentally sustainable farm by a registered member of the British Columbia Shellfish Association. The Pacific Kiss promotion focused on three target audiences. The first was international visitors and local diners who were introduced to a gourmet dining experience featuring a platter of a dozen Pacific Kiss oysters from 12 different areas. The Pacific Kiss Platter was served in restaurants on Vancouver Island (including several in the Comox Valley) and in the cities in and around Vancouver. A flyer that identified each oyster’s location on the plate, the regions where they were grown, and their unique culinary qualities accompanied each platter. The dining experience was interactive and fun, much like a wine tasting, and created a wonderful dialogue about food in general and BC oysters in particular. As a result of this special campaign, on Valentine’s Day 2010, oyster lovers in Vancouver devoured an astonishing 500,000 raw oysters! As expected, many of those oysters were consumed and enjoyed by Olympic visitors from other nations. The program will continue in 2011 and the Pacific Kiss Platter is expected to get rave reviews again this Valentine’s Day and in the months to come. The second focus was to use the Pacific Kiss promotion to educate chefs about BC oysters. It is important that chefs understand that buying BC oysters is supportive of local growers, similar to how we have been educated to support fair trade coffee, tea and chocolate. On September 10, 2010, BCSGA introduced BC oysters and the Pacific Kiss promotion to more than 500 chefs from across Canada who attended the Chefs’ Congress in the Cowichan Valley. “When you take 12 different Pacific Kiss oysters from various regions in British Columbia, taste each of them and experience their differences, you start to better appreciate the industry. As chefs, we are now able to form relationships with individual BC shellfish farmers who produce some of the best shellfish in the world,” says Robert Clark, executive chef of C Restaurant in Vancouver. The third target is the people of British Columbia, in an effort to foster local pride in and knowledge of the product. “The people of British Columbia should be thankful that we live in a part of the world with waters that are pristine enough to support a viable shellfish industry,” explains Stevenson. “Not only do these farmers provide a delicious and nutritious local food product, they export it around the world and play a significant role in supporting the local economy. “From a food safety perspective, all BC shellfish is grown under stringent Canadian standards and all fresh or frozen product is certified for export to the US and other international markets,” she adds. FMI: BC Shellfish Growers Association, www.bcsga.ca or call 250.890.7561. Celebrate the Sea! The BC Shellfish Growers Association invites you to come and celebrate the bounty of the sea at the 5th Annual Shellfish Festival. The Gala Dinner will be held June 17th at the historic Filberg Lodge and Park and the day-long festival will be June 18th at the Comox Marina. More than 4,000 people are expected to attend this year’s event to sample shellfish from various producers, learn about the industry and have fun. you will spot the occasional seal popping up for a breath of fresh air. There are cormorants and other sea birds bopping along on the waves. Instead of crowing roosters and cackling hens, you will hear the cacophonic cries of seagulls and the chirps of a bald eagle as he surveys his territory from a vantage point atop a nearby cedar. The students at George P. Vanier Secondary School in Courtenay lug extra-heavy backpacks to school for several weeks each December. Principal Charlie Schellinck watches them with a mixture of pride and nostalgia as they make their way to their classrooms and drop food donations into the Sharing the Christmas Spirit collection boxes. It is not just Vanier students that are carrying extra food to school this time of year. Almost every classroom in every school throughout Districts 71 and 93, and the Christian School, are involved with the program. Of the 650 hampers distributed every Christmas, close to 300 come from local schools. Individuals, churches, businesses, service clubs and community groups sponsor the rest. The Salvation Army has a similar hamper program and distributes an additional 750-plus hampers to families in our community. For Schellinck, Sharing the Christmas Spirit brings back bittersweet memories of Christmases past. Today, most people identify the program with the Coast Realty Group but it was Schellinck’s mother, Tucky, who was the inspiration for this particular program. Tucky started distributing food and clothing to people in the Comox Valley in 1962. By the 1970s, with the help of many volunteers and the Catholic Women’s League, the program had expanded to include several hundred Christmas hampers. In 1987, for example, records show that 772 hampers were distributed to a total of 2,765 Comox Valley residents and more than $40,000 in cash donations was received. All of this was orchestrated from the basement of the Schellinck’s family home. In 1988, Hank Schellinck retired and he and Tucky moved from their home on McPhee Avenue to a beach house. The idea was that Mrs. Schellinck would also retire and stop collecting for the food hampers. She recruited husband and wife realtor team, Brent and Donna Cunliffe, to take over the program—keeping an ever-watchful eye on their progress. Later, the Cunliffe’s became part of the Coast Realty Group and the effort was re-named the Sharing the Christmas Spirit Hamper Program. It is now a registered not-for-profit society. In 1998, Rob Phillips moved from Vancouver to the Comox Valley and joined Coast Realty. He was assigned to be coordinator for School District 71’s hamper collection program. When the Cunliffe’s retired in 2009, Phillips was voted by acclamation to oversee the entire program. Once space is secured, Budget Rent-a-Car donates the use of a moving truck and hampers are collected from the schools. Over a period of 18 days straight an army of volunteers, coordinated by Ken and Fay Jones, put in long hours to ensure that every hamper has all of the necessary items. The Liquor Control Licensing Branch donates hundreds of stuffed toys; Dairyland provides several hundred litres of milk, and Courtenay Country Market, the local media and a number of other local businesses contribute time, funds, products or discounts on merchandise. On delivery day—this year it is December 22—a posse of more than 100 volunteer drivers arrive to pick up and deliver two big rubber totes filled with food, gifts and community spirit to each of the selected individuals and families registered with the program. The hampers are delivered to homes from Fanny Bay to Black Creek, as well as Courtenay, Comox and Cumberland. In the past, a few hampers have even been delivered to Denman and Hornby Islands. The total value of this effort is now in excess of $100,000. The Coast Realty hamper program is only one of several goodwill initiatives in the Comox Valley. To avoid duplicating services and ensure as many people as possible benefit from the various programs, Coast Realty works in cooperation with the Salvation Army and others to compare and streamline lists of potential recipients. Dian Smit, owner of North Island Nerds on Site, says that words alone can not express how emotionally overwhelming it is to be on the receiving end of a Christmas hamper. Smit’s two sons are now grown up and she is successfully operating a home-based business that provides mobile computer support to businesses and individuals, but there was a time in her life where it was hard to be optimistic about what the future might hold. Christmas, for her, was just an ominous date on the family calendar, a reminder of how difficult it was going to be to be able to afford food, let alone gifts, for her children. For six consecutive years, receiving a Christmas hamper a few days before Christmas gave her hope. For the next three-and-a-half years, Smit attended North Island College and worked between semesters to earn money. For the first couple of years, Smit signed up for the hamper program on her own. Later, when she felt she was managing okay, she did not. Someone in the community, however, recognized her struggle and put her name on the list as a gesture of kindness and support. “The hampers provided me with enough food for about three weeks,” explains Smit. “In addition to lifting my sprits, it gave my food budget a break and enabled me to buy warm clothes for the boys and to have some extra money to pay the hydro bill. Most people don’t realize it but things like shampoo and toilet paper that we normally take for granted are a most welcome addition to the hampers. Every donation to a food bank or hamper program is appreciated. Two packages of spaghetti and a bag of oatmeal go a long way to feed a family. Getting the staples—like flour and sugar—was very much appreciated. Getting something extraordinary—like chocolate chips so we could make Christmas cookies—was a welcome surprise. It has been more than 10 years since Smit has received a hamper but she says that she will never forget how much it meant to her family. She shared her story with InFocus because she feels it is important to clarify that people who receive community support like this are not burdens to society. They are just regular people who are down on their luck and need some help. A hamper is a ‘hand up’ not a ‘hand out’. Smit’s heart-felt gratitude has now fostered into a spirit of giving back. On November 23, 2010, she partnered with Kathy Birkett Virtual Assistant and Beth Campbell Duke Personal Branding to host a social media class at Serious Coffee in Courtenay. Admission was by donation of non-perishable food items to the ‘Fill the Beetle, Feed the People’ food bank program supported by Nerds on Site in communities around the world. Smit was all smiles when she drove her red polka-dot Volkswagen beetle to the food bank to deliver a trunk full of food the next morning. Sharing the giving spirit of Christmas in the Comox Valley is not always done through non-profit groups and community associations. Many people make an effort to brighten the lives of others in small but impactful ways. Carolyn Price-Touhey of Two Eagles Lodge in Union Bay says she and her husband Steve now share the spirit of Christmas by adopting an open door policy on Christmas day. Karen Provost of ReMax recalls another story that exemplifies the Christmas spirit. Adds Lauren MacLauclan, from the Law of Attraction Training Room: “By intentionally and genuinely giving to others, or by expressing thankfulness and appreciation in any way, shape or form, you will be getting back what you are giving out. close to 300 come from local schools. Individuals, churches, businesses, service clubs and community groups sponsor the rest. The Salvation Army has a similar hamper program and distributes an additional 750-plus hampers to families in our community. with plenty of frosty gin-and-tonics in between—and so I assumed I knew everything worth knowing about this versatile spirit. That assumption was entirely washed away on a recent visit to Island Spirits, a craft distillery nestled in the Hornby Island forest. With my first sip of Phrog Gin, Island Spirits’ signature product, I realized I was in a whole new spirit world. All those great, if rather fuzzy, memories of drinking gin in the past faded away. This was a different gin experience, one I wanted to repeat. So I sipped again. Phrog Premium Gin owes its quality to an ultra-pure distillation system and to a special recipe that adds just the right proportions of 14 botanicals: juniper berries, of course, but also coriander seeds, licorice root, cinnamon, lemon peel zest, lime peel zest, cardamom seeds, cumin seeds, cloves, fennel seeds, caraway seeds, star anise, angelica root and lemongrass. This gin is the result of three-and-a-half years of experimentation. Dedicated to the twin ideals of purity and quality, Kimmerly and Abdurahman patiently tried out 40 different variations before coming up with the final product. They put equal care into the creation of Phrog Premium Vodka, their gin’s sister product, and into three unique vodka infusions: Black Jelly Bean Sichuan, infused with star anise and Sichuan pepper, Aquavit (with anise, fennel and cumin) and Vanka (subtly flavored with vanilla bean). These are spirits made for sipping, perhaps with a small splash of spring water, much as people sip a good single malt Scotch whisky. It’s not just the drinking experience that’s remarkable, says Kimmerly. The morning after is notable as well—he and Abdurahman promise that their liquor is so pure it causes no hangover. This may or may not be true (and I look forward to testing the theory) but one thing is certain—this is a very sophisticated product. Jurgen Gothe, one of many journalist-connoisseurs to praise the Phrog products, writes: “Phrog Gin is one of the loveliest new gins to arrive in the decade since all those high-end gins have really come into their own. All this from a cozy, hand-built facility at the end of a dead-end gravel road on a small Gulf Island. The story behind the Phrog spirits is a curious combination of do-it-yourself traditionalism and advanced science. This blend makes perfect sense once you know the background of the two partners. Kimmerly was a former ice-breaker captain in the arctic. The company he worked for didn’t allow staff to bring alcohol on board, so Kimmerly started making his own. Up in the arctic, stuck on a ship, surrounded by ice, he had plenty of time to learn, by trial and error, how to set up a still and successfully concoct a more-than-decent batch of alcohol. He picked up ideas from observing how salt water was distilled to provide drinking water on board. In 2003 he moved to Hornby, where he served as ferry captain before retiring last year. Dr. Abdurahman, in contrast, brings his knowledge straight from the lab. A now-retired Professor of organic chemistry at UBC and BCIT, Abdurahman contributes not only scientific expertise but also useful contacts. For instance, Island Spirits was able to send its product to the University of Toronto for a Gas Chromatography-mass spectrometry Analysis (a test for impurities) on UofT’s state-of-the-art machine. “We were the first distillery in Canada to have this type of testing,” says Kimmerly proudly. He’s even prouder of the results. The tests showed their product was pure alcohol to the ninth decimal place, satisfying Kimmerly and Abdurahman’s near-obsessive quest for purity. When the two men met seven years ago, distillation was a hobby. Over the years it naturally evolved, encouraged by the enthusiasm of their many friends on Hornby, many of whom participated in the development of the gin and vodka. “There’s a party here every other night. We’d take along our latest batch and see what people thought, make notes, and then adjust our process once more,” says Kimmerly. As the recipe matured, so did its presentation. The name Phrog was chosen in homage to the spring chorus of randy tree frogs from the pond beside the distillery, with the playful Ph a nod to the rigorous science underlying the project. Early versions had a home-made label on a wine-bottle, but when the product outgrew that type of packaging, Kimmerly and Abdurahman hired a graphic designer from the Napa Valley to upgrade their look. The result was a sleek, stately clear glass bottle with clean lines and a heavy base, imported from France, with an eight-layer melted-on label offering a bare minimum of words: just “Phrog Premium Gin” (or Vodka). It’s clean, simple and classy, but not at all conservative, just like the spirit it holds. While the product and packaging are urbane and elegant, the distillery maintains a modest country vibe. The main building, next to Kimmerly’s house and portable sawmill, is a cedar-shingled barn-like structure with big red doors. Inside, the feel is part science lab, part workshop, and part drinking establishment. An elegant three-metre long bar commands the centre of the room. This is where visitors sit to taste the various blends. Behind the bar is the main still—a convoluted construction of copper pipes, plastic tubes, levers, switches, thermostats, funnels, glass vials, computerized monitoring devices, and more copper pipes, about six feet tall and five feet wide. It looks like something out of a Harry Potter movie set, or perhaps Charlie and the Chocolate Factory. While the workings of the still may seem magical to the uninitiated, such as me, it is in fact a highly-engineered system. “This still is really more suited to a lab than a distillery,” says Kimmerly. He launches into what to him is an abbreviated explanation, distillation for dummies, so to speak. There’s lots of talk of differential back pressure, equilibriating alcohol columns, and reflux ratios, but it pretty much goes right over my head. Until we get to the end of the process, which is pleasingly simple: a clear liquid drips steadily out of a plastic tube into an old-style glass jug. This I can understand. The still, explains Kimmerly, is calibrated to circulate the vapors a hundred times or more. This is one of the keys to the liquors’ purity. Another key, he explains, is that this is a batch-run still, which means that it distils one batch of liquor as one cycle, rather than the more common continuous-run still where the liquid is continuously fed into the system. This gives him a great deal more control over the process. Kimmerly would probably love to talk about, and tinker with, his marvellous distilling machines all day long, but there is more involved in running a business, especially one involving hard alcohol. The biggest challenge, he says, has been finding ways to make the business viable without becoming too big. “We never would sacrifice quality for quantity. And we don’t want to get so big that this becomes a rat race,” says Kimmerly. The small scale approach of Island Spirits is part of its charm, not just for its owners but for its clients. “The modest footprint of the distillery is a pleasant reminder of when spirits were distilled from small companies around the country, instead of today’s massive factories where speed and quantity rule, rather than patience and quality,” comments culinary writer Don Genova. But while small may be beautiful, it is not practical given the current alcohol distribution system in British Columbia. BC’s liquor laws date back to the prohibition era, but these days the government keeps tight control for financial rather than moral reasons. Liquor distribution is big business, bringing in about $850 million annually for the BC government. The all-powerful Liquor Distribution Branch (LDB) effectively owns all distilled spirits as soon as they hit store shelves, charging a 173 per cent mark-up, which comes on top of a hefty federal excise tax. That doesn’t leave much room for the store, the distributor, and the producer to make a profit. “Only the huge operations can make it in this environment,” says Kimmerly. And only medium-to-large operations can consistently manufacture the minimum 10,000 bottles/year needed to place a product in the LDB outlets, so Island Spirits is limited to private liquor stores. These, unlike the LDB stores, can charge more for a popular product (and many of them do so for the Phrog brand), but this doesn’t trickle down to Island Spirits. Kimmerly explains that for every $50 bottle of Phrog spirit sold, the company ends up with $12.50, which barely covers the costs of producing, bottling and shipping. Even when they sell from their own site, which they have a licence to do, they are required to remit all the money to the LBC, which eventually sends them a cheque for their small share. Another obstacle for craft distilleries is the fact that they can’t distribute their products directly. “We send our stuff to the specialty warehouse in Vancouver, and private stores get it from there, even if they’re in Victoria. So if I want to sell my gin at the Hornby Coop [about a five-minute drive from the distillery], each bottle has to ride six ferries and go through six warehouses!” says Kimmerly. But change is coming, he believes. Island Spirits has joined forces with BC’s six other craft distilleries to lobby for regulatory changes. They are asking for the sorts of arrangements that laid the foundation for BC’s successful wine industry and the proliferation of microbreweries around the province. This would include the right to make direct sales to restaurants, the easing of the LDB portion of direct sales made from the distillery itself, reduction of steep excise taxes, and an overall lower LDB mark-up for qualifying craft distilleries. In the meantime, business is booming. Phrog Premium Vodka and Gin are available at 25 stores in BC and 14 in Alberta; also, onsite sales are brisk. Clearly, Kimmerly and his partner are confident in the quality of their product. As for all the rest—negotiating with the LDB, lobbying the government, figuring out how to grow the business appropriately —he is willing to be patient and persevere. 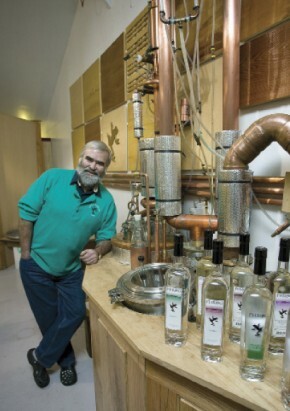 “You have to be passionate to do this,” he says, “And you have to be an optimist.” And having an exceptional, ultra-pure, made-on-site liquor to sip at the end of the day certainly helps keep the spirits up (no pun intended). see I have drank gin in various incarnations over the years—from syrupy Singapore slings to sophisticated martinis, purchase with plenty of frosty gin-and-tonics in between—and so I assumed I knew everything worth knowing about this versatile spirit. a craft distillery nestled in the Hornby Island forest. I have drank gin in various incarnations over the years—from syrupy Singapore slings to sophisticated martinis, with plenty of frosty gin-and-tonics in between—and so I assumed I knew everything worth knowing about this versatile spirit. lights and baubles, viagra poinsettias, golden roast turkey, carols, the infant in the manger, family gatherings. And in the hearts of children of all ages, there is Santa Claus, the rotund and jolly purveyor of gifts and good cheer. As it does for most of us, Gail Challender’s connection with Christmas goes back to her childhood. However, for this Courtenay resident, Christmas is an ongoing aspect of her life throughout the year, rather than just a seasonal thing. In truth, her memories of those Christmases of yore back in her Saskatchewan childhood home aren’t all happy ones. She was the second youngest child in a family of eight kids, and there wasn’t a lot of money to be spread around for gifts. But, she’s philosophical about that. She’s philosophical because there was for her always one wondrous vision that sustained her back then—and it still does today, perhaps in a slightly different way. That compelling vision and symbol is Santa Claus. Challender is confessedly a great and persistent believer in that ‘Jolly Old Elf’ because she feels deeply the concept is magical and mystical and it is one that exudes what Christmas should be, in her eyes—a time of generosity and giving and also appreciating what you have. Spend a few minutes in conversation with her and you might find yourself believing, too. It’s not a bad route to take in an otherwise troubled world. Not one to let her Santa Claus connection lie solely in the realm of passive appreciation, however, Challender has developed an amazing avocation that is devoted to extolling Santa Claus in all his glory and in manifestations that reflect many cultures and lifestyles. She is a Santa Claus sculptor par excellence and virtually anybody who has gazed on her creations has been astonished by both her artistry and the painstaking work that has gone into bringing about what in lesser hands would only be a cliché image of Father Christmas. The conventional image of Santa was first popularized by American political cartoonist Thomas Nast in the 19th century as an illustration for Clement Moore’s poem, The Night Before Christmas. He was later lionized, agreeably enough, in a series of yuletide advertising images by the Coca-Cola company down through the decades of the 20th century. Eventually Santa became the default image of the season, sometimes to the consternation of those who would embrace the religious aspect of Christmas, to the exclusion of other considerations. However, as far as the cultures of many societies in the western world are concerned, Santa is a mainstay and won’t go away. Challender herself has no personal problem with the stereotyped images of Santa, but she realized a few years ago she was looking for something unique, something of her own that could capture what she felt about Christmas. What her artistry evolved into was a desire to create a genuine three-dimensional Santa figure that would be as human-like as possible. That became her quest. One aspect of her painstaking drive for authenticity stems from a skill she mastered at the age of 13—sewing. The unique and highly original faces of her Santas, which begin as drawings and then are transformed into three dimensions, are fabricated from sculpting clay, which turns ceramic hard when it’s cured. She then hand paints them after they have hardened. Particularly noteworthy are the eyes—those genial yet wise Santa eyes. Her skills with the faces come from two sources. First it was her ability to draw, because that is such an essential part of the process. But secondly, and perhaps more importantly, it is her understanding of the structure of the human face and how certain areas need to be highlighted. She notes that she worked for Estee Lauder doing makeup a number of years ago. 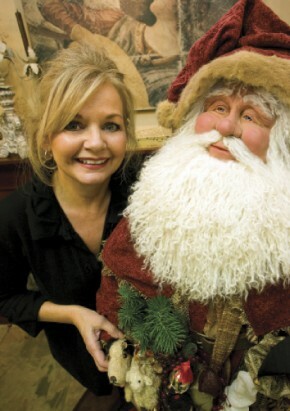 She began creating her Santas about 20 years ago, originally with mass-produced porcelain heads. But, from that time her artistry has evolved immeasurably and she has become a master sculptor in her own right. The big change away from cliché images came about to a degree with the one-on-one training Challender received from the sculptor she describes as “brilliant”—Judith Klawitter in Idaho. A few years ago, while Challender was temporarily living in Oklahoma, she was commissioned by the Guthrie, OK Territorial Christmas Committee to design and fabricate an elf that was used as a signature theme for their Christmas ball. Also, during this same time, Challender began showing her works at a gallery in Guthrie, and continues to be shown at that gallery to this day. From such welcome public exposure she began to sell many of her figures and to receive commissions for others from all over the US. Since returning to the Comox Valley in 2008—she lived here before departing for Oklahoma in 2004—Challender has enthusiastically continued with her work. But it was while she was in Oklahoma she got the commission to create her life-size golfer Santa. She based the six-foot-tall figure on the so-called Father of Golf, Old Tom Morris (1821-1908), of St. Andrews, Scotland, who did much to popularize the game enjoyed by millions today. The real Morris was a white-bearded imposing figure invariably attired in Scottish tweeds. And so is the Tom Morris golfer. Consequently, Challender had to find the old tweed suit, and working from pictures she created the figure with the old golf-cart filled with toys—antique toys. But, to show her attention to detail, the golfer Santa is holding a golf ball in his hand. But, not just any golf ball. She scoured antique shops until she unearthed a century old golf ball of the sort Morris might have used. One of the most challenging tasks for her as an artist—aside from the faces—is the hands. You have, after all, a left and right hand and the hands must be proportionate to the stature of the figure, and must be distinctly left and right hands. She doesn’t like to cop out and simply stick on gloves or winter mittens. She wants hands that look like hands and are proportionate to the head in size. As she creates, the materials she needs must be constantly added to and in that she gets to indulge another passion, and that is scouring antique stores to find items she either needs immediately or that she might use in the future. If a sleigh is called for, as an example, it cannot be a modern sleigh, even if she can make it look older. It must be the real thing. She’s a purist that way. A number of the really old sleighs she has used with her Santas have come from Germany. It’s an arduous and time-consuming process once she sets down to work. In the case of the golfer Santa she received her commission in December and the final creation was expedited to the man who ordered it, the following June. Final sale price in that case was $6,000. Asked if she broke that time down into what she was making hourly, she says she wouldn’t do that at any time. Challender has completed, aside from the golfer Santa, a number of thematic Jolly Old Elves; and why not? Santa is, of course, universal, whether he is Santa Claus, Father Christmas, Kris Kringle or whomever. The message of the season is invariably the same and that, to her, is the charm of it all. Does Santa just have to be a white guy? Not a bit of it, she says. Her Santas can be in any ethnic hue, again because the message is universal, so the figure can change accordingly. The Santas can also be of any size, from elfin to full human stature, depending on what the buyer wants. She also personalizes the Santas, if so desired by the people offering the commission, by working in some of their jewelry, family heirlooms or old clothes they cherish as personal commemoratives. Challender remains available for commissions. At the moment she has two Santas underway or at least conceptualized. One is a skiing figure, which features antique skis and poles and high-laced Swiss boots. Following the completion of that one, she is looking in the direction of a fly-fishing Santa who will be geared out in vintage Haig-Brown style angling garb. This will demand, she says, a classic fly-rod, which will not come cheap, and a wicker creel for the fish.